Barcelona's Lionel Messi celebrates one of his goals in their Champions League second leg tie against Lyon. 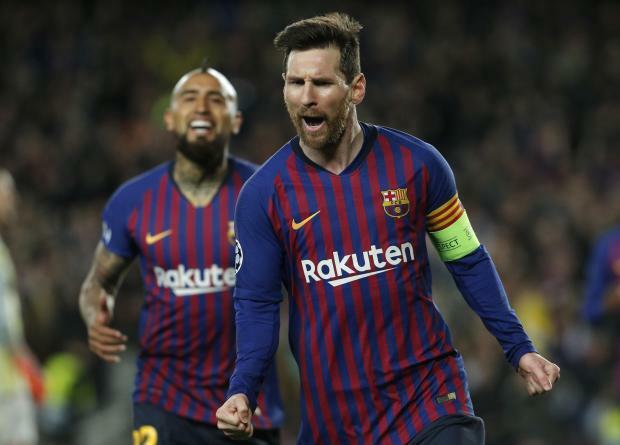 Lionel Messi came up just short of matching Cristiano Ronaldo's hat-trick a day earlier but still scored twice and set up two more as Barcelona beat Lyon 5-1 on Wednesday to reach the Champions League quarter-finals. After Ronaldo's treble on Tuesday for Juventus sent Atletico Madrid packing in Turin, Messi delivered his own symphony at the Camp Nou, where Lyon were outplayed save for a very brief period in the second half when they threatened a comeback in this last-16 tie. A 0-0 draw in France in the first leg last month meant Lyon always had a chance to make Barca nervous, but Messi's sumptuously chipped penalty and a simple finish from Philippe Coutinho looked to have finished the tie before half-time. Yet Lucas Tousart's volley left Lyon one goal away from putting Barcelona out, only for Messi to take charge. He scored once more, before teeing up Gerard Pique and Ousmane Dembele to complete the victory. Messi now has 108 goals in the Champions League, behind Ronaldo's imperious 124, but his latest double takes his team one step closer to the trophy they crave the most. They go into Friday's draw for the last eight as the sole Spanish representative, along with Juventus, Manchester United, Manchester City, Liverpool, Tottenham Hotspur, Porto and Ajax.